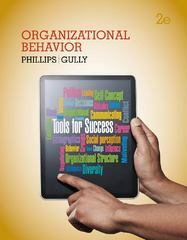 Organizational Behavior 2 Edition Introduce the tools to achieve personal and managerial success with Phillips/Gully's ORGANIZATIONAL BEHAVIOR: TOOLS FOR SUCCESS. Written by award-winning instructors, this book uses meaningful, relevant examples within each chapter to help translate today's most recent OB research and significant theory into applicable skills. ORGANIZATIONAL BEHAVIOR is ideal for launching or advancing any business career as focused self-assessments, an emphasis on using technology to increase productivity, and innovative decision-making videos clearly demonstrate the immediate value of what you're learning. Discover the impact of OB today on both your personal and professional experiences and career success. This unique book highlights the importance of technology resources and their impact on productivity. Innovative decision-making videos enliven learning with a focus on understanding the role of OB in your personal success. Count on ORGANIZATIONAL BEHAVIOR to help you master the most important aspects of successful leadership and career success. Available with InfoTrac Student Collections http://gocengage.com/infotrac.